With the growing demand of business for tighter communication and collaboration with external parties such as business partners and customers, IT has to provide the technical foundation for such integration. Web Access Management and Identity Federation are key technologies for that evolution. They enable organizations to manage access both from and to external systems, including cloud services, in a consistent way. Organizations have to move forward towards strategic approaches to enabling that integration, in support of the Extended and Connected Enterprise. 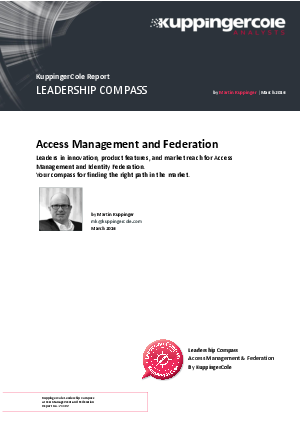 This Leadership Compass provides an overview and analysis of the Web Access Management and Identity Federation market segment, sometimes referred to as Access Management/Federation. Picking solutions always requires a thorough analysis of customer requirements and a comparison with product features. This Leadership Compass will help identify those vendors that customers should look at more closely.